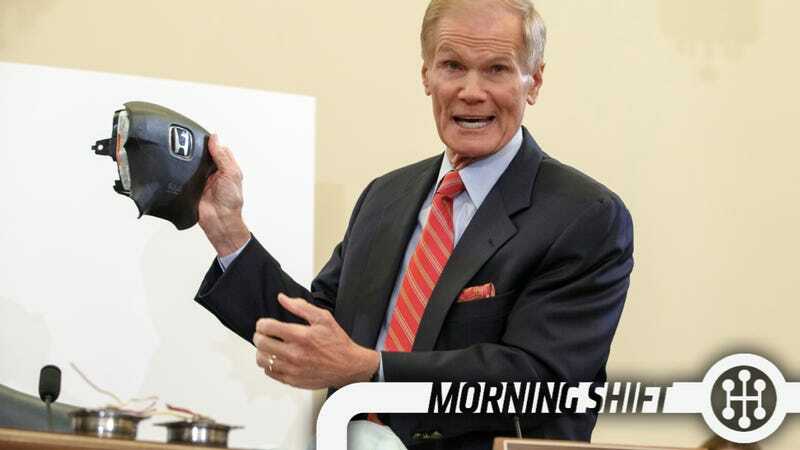 1st Gear: "I Didn't Want My Name Associated With It"
A former employee of troubled airbag maker Takata says he told the company there would be terrible consequences if they want ahead with a plan to use ammonium nitrate to inflate their airbags. These are the same airbags which have forced the recall of more than 24 million cars. Mark Lillie, who left the Japanese auto-parts maker in 1999, said his departure was tied to Takata’s disregard of his warnings against using the chemical compound ammonium nitrate to inflate its airbags. More than 24 million cars with Takata inflators have since been recalled worldwide because the devices can deploy with too much force, causing them to rupture and shoot metal fragments at motorists. You should read the full story as it lays out the case nicely, as well as the history of the chemical's use. How much do you really save when you cut a $1 part out of an important system in a car? GM is probably doing that math right now as it has already paid out $93 million in compensation to victims, or families of victims, harmed in cars with ignition switch defects. Biros said the program has made 93 settlement offers; 40 have been paid and 49 accepted; none have been officially rejected. The program has determined that 482 of the claims are ineligible, including one that sought compensation for a dog that died, and another seeking funds for an early 1960s Chevrolet. If the dog died in a car with an airbag malfunction I sort of understand. It can hurt to lose a beloved animal, though I'm not sure if a functioning airbag would have helped. The worst way to not sell a car is to have demand for it but not have the actual car built, which is an issue Honda and Subaru could face if a Union-led slowdown on West Coast ports cripples shipping there. Thus, Subaru and Honda are just flying in the parts they most need. What we don't know, as Bloomberg reports, is how much extra airlifting those parts will cost. My guess is less than what it costs to make the car, more than what it costs to ship the parts. While the rest of the world is a challenging place to sell cars right now, Toyota's huge selling base in the United States and a weak yen means that Toyota is still banking giant profits and will continue to bank giant profits so long as the yen stays advantageously low. The robust results underscore Toyota’s continued sensitivity to exchange rates. Like other Japanese automakers, it has benefited over the past year from the yen’s retreat against other currencies, as the Japanese government pursues an ultra-loose monetary policy in an effort to jump start the country’s economy. Third-quarter operating profit was lifted by a 145 billion yen ($1.21 billion) windfall gain from the weakening yen. The yen’s decline against the dollar and other currencies aids Japanese exports and boosts the yen-dominated value of overseas earnings. Managing Officer Takuo Sasaki said the yen’s faster-than-expected weakening was a key reason the company lifted its profit forecast for the current fiscal year ending March 31. Ford's demand in the first quarter is expected to be so strong that they're going to have to add 1,500 new workers. Not a big deal, except that as part of their two-tier wage agreement they can only keep a certain number of people at that lower tier. Therefore, Ford will give roughly 300-500 people a potentially large raise. Although all three domestic auto makers hire workers at an entry rate, Ford is the one with a cap on how big a percentage of hourly workers can be classified as second tier. Ford’s mix is capped at 20%, meaning only 10,000 of its 50,000 workers can make the entry-level wages. New hires are brought in at $15.78 an hour and then given 5% raises annually, topping out at $19.28. Of course, two-tier is one of those issues the UAW will be debating going forward. On this day in 1878, Andre Citroen, later referred to as the Henry Ford of France for developing his country's first mass-produced automobiles, is born in Paris. Citroen revolutionized the European auto industry by making vehicles that were affordable to average citizens. Neutral: Do You Know Which Airbag Is In Your Car? There are only a handful of companies making airbags, do you have any idea who makes the airbag in your vehicle?